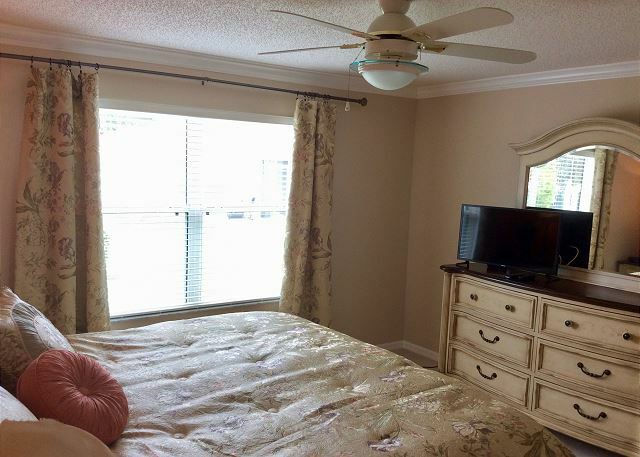 Location, Location, Location....This beautifully decorated 2 bedroom home is located in Liberty Park and is about five minutes from Lake Sumter Landing Market Square where you'll find restaurants, movie theaters, shopping, live music and dancing every night. When you are ready to get involved in all the fun activities here, you are only minutes from either the Alamanda Recreation Center or the Liberty Park Neighborhood Recreation Center. At the Alamanda Recreation Center you'll find a family friendly swimming pool, billiards tables, horseshoe pits, bocci ball, shuffleboard and organized activities such as cards, board games & group get together. At the Liberty Park Recreation Center you'll find an adult only (age 30 or older) swimming pool, bocci ball, shuffleboard and horseshoe pits available. You'll feel welcomed and relaxed as soon you open the front door to your home away from home. This home is beautifully decorated and boasts a bright open floor plan. 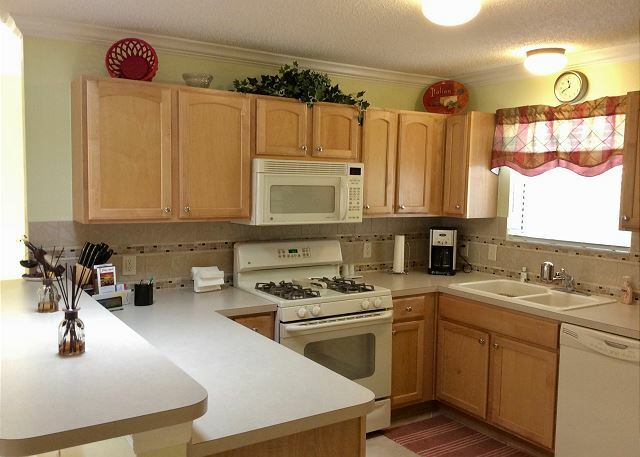 The kitchen is complete with everything you'll need to prepare and serve meals. (If you choose not to cook...there are many wonderful restaurants to try) The Living room offers plenty of comfortable seating if your entertaining friends or family or just enjoying your favorite television shows on the flat screen TV. The master bedroom has a comfortable king size bed, a TV for your enjoyment, large walk in closet, and a private master bath. The master bath offers a walk in shower. The guest bedroom has a comfortable queen size bed for your guests to feel at home while visiting. 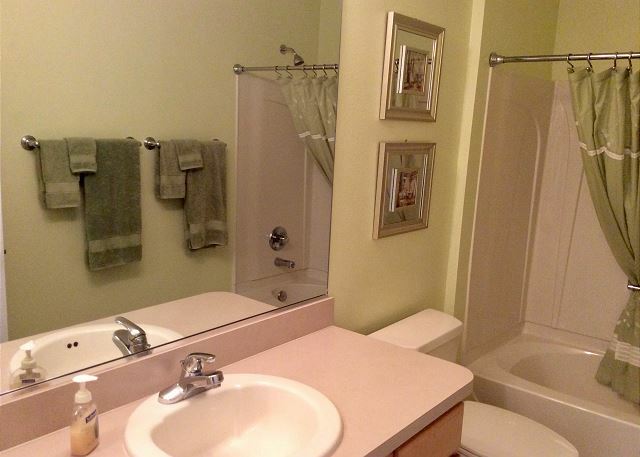 The bedrooms and both bathrooms are set up with extra towels and linens. 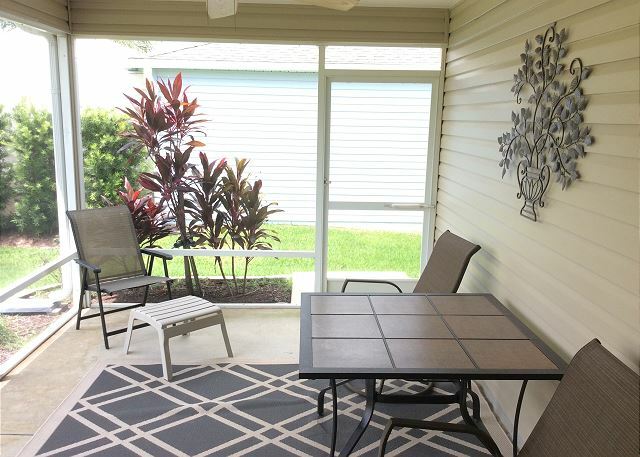 And of course there's a charming screen enclosed lanai set up with a table and 4 chairs making the perfect place for you to enjoy reading the morning paper with your coffee or juice or to sit and relax at the end of a busy day of activities. 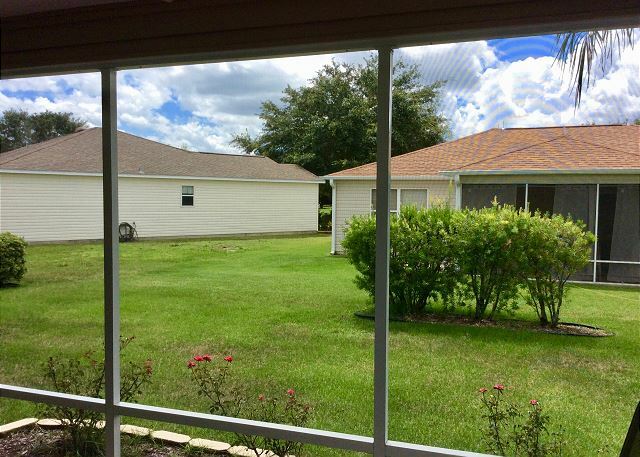 This dog friendly home comes complete and includes wi-fi internet connection. With The purchase of resident ID cards you can use any of the 29 executive golf courses with no greens fees. And these executive golf courses are not your typical 'pitch & putts'. They present some challenging par 3s and the occasional par 4, with three sets of tee boxes to accommodate golfers of different skill levels. You pay resident rates on greens fees at the 11 championship courses. You're also entitled to use any of the family friendly and adult only (30 or older) swimming pools, organized activity swimming pools, bocce ball, shuffleboard courts, horseshoe pits, billiards tables, tennis & pickle ball courts, basketball courts, sand volley ball and over 1000 organized activities every week through the recreational centers. It was very comfortable, but an area rug in living room would have given a much homier, warmer look and feel. The tile floors were nice, but cold. New locks on front door and storm are needed. Longer chains on ceiling fans for the lights are needed. Toilet in guest bathroom leaked, shower in master leaked, faucet in master leaked, we reported but didn’t get fixed. We are happy to hear that you enjoyed your get away this winter. Thank you for your great suggestions, I will be sure to pass them on to the owner. We hope to welcome you back again soon. We loved this place. It has everything you could possibly need. It is beautiful, clean and conveniently located. We couldn’t have asked for more. Looking forward to returning!